The finest things in your work space don't have to be expensive. The VQV Furniture Group offers its collection of private office desks for the most sophisticated executive suite and for your stylish home office. All at an amazingly low price. Another appealing feature of our office desks is the multitude of office storage cabinets to choose from to make your work space more efficient. Our discount office furniture includes desk cabinets, lateral files, and wardrobes to accent your executive office furniture. All exterior hardware is high quality and all file cabinet drawers feature full-extension ball-bearing slides. Our office design specialists can help you select the best office furniture to improve your office productivity and help you save time and money. Browse through the executive desk collections below. Click one of the images below to find additional details about each desk collection. Our office design specialists will be happy to help you find the right configuration to meet your needs. We can help you turn an ordinary office desk in to an extraordinary work space. Give us a call at 877 878-8770 for a price quote. Mira Office Furniture is a complete modular collection of executive desks. MIRA offers freedom and flexibility in office design. Featuring a hardwood edge, desk tops of 1-1/2" thickness, and the AA grade North American veneers, MIRA's Medium Cherry finish provides an elegant and classy look. When designing an office interior for maximum performance, versatility and style, take a close look at MIRA. This executive office furniture is complete modular series of desks, files and cabinets. We will be happy to help you design a configuration to fit your office needs. MIRA's 10-year warranty gives testament to its exceptional quality. Functional and beautiful, affordable and always available. Aberdeen Office Furniture is an all-laminate line of executive desks designed to perform. Beauty and balance are provided to any office setting with simple, yet functional details in a transitional style to meet the needs of today's fast paced business environments. Its durable 1 5/8" thick surfaces, vertical grain modesty panels and distinctive fluted edge provide a consistent aesthetic throughout. A wide variety of executive desk configurations enhance workspace flexibility and provide multiple storage solutions that meet both personal and team needs. The entire Aberdeen line is in stock with a 72-hour lead time and is backed by a limited-lifetime warranty. Quality, Style and Affordability, what you have come to expect from the Mayline Group. Corsica Office Furniture appeals to those with sophisticated tastes. Feeling right at home in either a contemporary or traditional setting, Corsica offers refinement and quality typically found at two or three times the price. executive desks have surfaces that are a full 2" thick with a tapered edge for a comfortable, yet substantial feel. Combinations of pedestals, credenzas, returns , hutches, and wall cabinets fill each office with productive elegance while maintaining the overall aesthetic of the line. Eclipse Office Furniture makes a bold, modern statement by combining wood, metal, and glass elements into an attractive, yet affordable package. Floating work surfaces are anchored by sturdy, functional pedestal bases, while the perforated silver modesty panels and frosted glass doors give Eclipse executive desks a strong sense of fashion. Offered in a choice of either a rich Espresso Walnut or inviting Warm Cherry finish, Eclipse is sure to please the forward-thinking organization. Take a step towards the future. Luminary Office Furniture is designed with today's sensible buyer in mind. The Luminary executive desks provide quality and versatility at an amazing price. Luminary is available in two finishes with AA-grade North American hardwood veneers used throughout. Veneers are book matched and highlight the natural beauty of the Cherry and Maple grain. Whether it is for private offices, conference rooms, or reception areas, Luminary is the smart choice. Who says you cannot afford first quality, wood furnishings? Napoli Office Furniture combines clean, modern lines with stylish accents and a wide selection of storage options. Curved desk surfaces merge together to define your space with elegance and efficiency. Napoli is hand-crafted with AA-grade North American select wood veneers using a 14-step finishing process to insure uncompromising quality and consistent beauty. Sorrento Office Furniture is the newest member of the REAL Office family of veneer wood furniture. Sorrento executive desks combine multiple species of hardwood veneers into an elegant, sophisticated offering that will appeal to the most discerning of tastes and the tightest of budgets. Luxurious wood veneer, leather lined letter trays, frosted glass doors, wardrobe cabinets and personalized stainless steel handle options make late nights in the office feel a little more like home. Sorrento is available in a Bourbon Cherry finish and an Espresso finish with AA-grade North American Hardwood veneers used throughout. CSII Office Furniture executive desks from the Mayline Group. Now there is no need to agonize over style, function, versatility or price. Building on a design using rugged all-steel construction, we have created a line of executive desks that boast of sleek functionality and a stylish new look, all in a package that registers high on the affordability scale. Now you can truly and creatively fine-tune your furniture to fit the personality of your office, from comfortable neutrals to bright, energizing colors. And everything in between. Del Mar Office Furniture With striking Sapele Pomele veneers; a Sedona Cherry finish; semi-matte, Black metal hardware; and subtle Shaker influences, the Del Mar Collection is a handsome alternative to the customary traditional office environment. The wood, wood veneer, and select wood product construction along with top surfaces finished with a durable Ultra-Violet topcoat, this collection will provide years of continued use for those demanding a great value office product. Offering a deep assortment of office furnishings, Del Mar can provide economical solutions for a multitude of office needs. Belmont Office Furniture The warmth of an Executive Cherry finish enhanced by elegant details such as inlaid reconstituted cherry veneer tops bordered by walnut banding and finished with a protective Ultra-Violet topcoat; semi-matte, Black metal hardware; and double beaded crown mouldings make the Belmont 7130 Collection an exceptional solution for any office environment. Executive nuances found in bow-front work surfaces along with felt-lined box and center drawers provide an ambiance of distinction. Pimlico Office Furniture The combination of bases and frosted glass modesty panels trimmed in Satin Aluminum along with a warm Bronze Cherry finish, the Pimlico 7024 Veneer Collection creates a striking high end, contemporary look. Subtle design elements include slightly recessed, angled edges and complimentary Satin Nickel hardware designed in a convex shape. Cherry veneer tops are protected by a polyurethane finish and are separated from the chassis with a Satin Aluminum recess that creates a ñfloating topî look. Basic pieces are offered in either an economical, flat-pack shipping carton or fully assembled. Rue De Lyon Office Furniture From the opulent Chocolate Patina finish and dark Platinum finished hardware with heavy highlights, to the hidden storage behind drop-front doors featured on the Overhead Storage, the Rue De Lyon Collection offers extras throughout and includes an expanded line-up to furnish any office requirement. Standard center drawers can double as keyboard trays and most pedestals feature felt-lined drawers. The Computer Armoire can serve as a fully functioning, stand alone office. Antigua Office Furniture Inspired by island living, the Antigua Collection brings enchanting details to any office environment with an expanded line-up to furnish any office requirement. Antigua showcases casual style with refined elegance in lightly carved details such as West Indies wood knobs with Antique Brass inserts and top surfaces constructed of Marquetry cherry veneers, all finished in a warm West Indies Cherry finish. Functional design involves a Computer Armoire that boasts a fully functional office behind the raised panel doors; a Computer ñLî Desk that includes a CPU tower cabinet; and a cable-ready Computer Credenza that includes a printer cabinet with a pull-out printer shelf. Keswick Office Furniture Mirroring the stateliness of early American history, the Keswick Collection has proven to be the majestic leader within traditional office environments. Offered in an impeccable English Cherry finish on cherry veneers with solid wood pilasters, bases, and shaped mouldings; Plated Brass finished pulls; and desks with both felt-lined center and top drawers, this collection emphasizes refined, traditional styling and unmatched luxury. Overhead Storage options include etched glass, leaded glass, or brass screen panel doors. Available with either an inlaid cherry veneer top bordered by walnut banding that is finished with a durable Ultra-Violet topcoat to prevent stains, mars, and scratches or a straight-grain, High Pressure Laminate Top, this collection is sure to please for many years to come. Oxmoor Office Furniture Named for one of the oldest and most grand estates in Kentucky history, the Oxmoor Collection makes a most impressive statement with a rich Merlot Cherry finish and expertly appointed details such as heavily highlighted, dark Antique Brass hardware and carved diamond patterned doors. The eye is quick to notice the solid wood, fluted pilasters and elegant, madrone burl accents. Each item within the collection is a finely tuned balance of design and function. Functional details include strategically located grommets for efficient cable management, easily accessible fully-extending drawers, and pull-out writing boards that conveniently expand work surfaces. Tops feature straight grain cherry veneer surrounding madrone burl veneer and walnut banding. Top surfaces are finished with a durable Ultra-Violet finish that is resistant to stains, mars, and scratches. Added indulgence can be found with leather inlays on the Executive Desk top. Governors Office Furniture An expansive line featuring an Engraved Executive Mahogany finish, the Governors Collection provides a stylish yet economical solution for any office environment. Traditional integrity is inherent in the attention to detail found in solid wood bases and shaped mouldings; mitered edges; recessed modesty panels; and swinging bail drawer pulls finished in an Antique Brass finish with medium highlights. Designed with the utmost function in mind, desks feature pull-out writing boards within each pedestal for expanded work surfaces; file drawers feature fully-extending, ball-bearing slides which effectively accommodate heavy loads and allow easy access to the entire drawer; and a convenient central locking system that locks all drawers with the turn of a single key. All surfaces are High Pressure Laminate (HPL) to prevent nicks, scratches, and stains. The Governors collection is on our GSA schedule. We have integrated our custom Bluetooth®-enabled speaker into a wide range of our favorite accessory products—allowing any work space to double as a dedicated conference call zone. Just walk up, turn it on, and wirelessly connect. Introducing an edgy solution to desktop power and data needs that takes your business where you want to go... even if it's just from one room to the next. 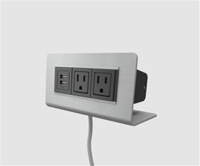 These portable convenience outlets bring new flexibility to the table, because they don't require cutouts to work surfaces. These power and data centers attach to the edge, fitting surface tops of varying thicknesses. Interport is the first power/data center of its kind. One touch open and closes unit. Leave open or closed while in use. Slip cords through the holes. Stand alone, or in modular multiples. 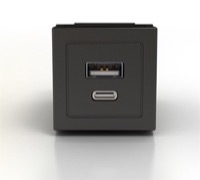 This unit has 4 USB-A connections for charging USB-powered devices and mobile electronics. For clean design and simple installation - you're in the right spot. PMAX is our new horizontal-mount desktop accessory, bringing power and data right to your fingertips. The PMAX delivers a fresh look in new colors, but with all the same great capabilities. For clean design and simple installation - you're in the right spot. The PMAX is a new horizontal-mount desktop accessory, bringing power and data right to your fingertips. The PMAX with USB Charging Ports deliver a fresh look in new colors, but with all the same great capabilities. For clean design and simple installation - you're in the right spot. The PMAX is a new horizontal-mount desktop accessory, bringing power and data right to your fingertips. The PMAX with one Data Port deliver a fresh look in new colors, but with all the same great capabilities. For clean design and simple installation - you're in the right spot. The PMAX is a newhorizontal-mount desktop accessory, bringing power and data right to your fingertips. The PMAX with USB Charging Ports deliver a fresh look in new colors, but with all the same great capabilities. For clean design and simple installation - you're in the right spot. The PMAS is a new horizontal-mount desktop accessory, bringing power and data right to your fingertips. The PMAS with USB Charging Ports deliver a fresh look in new colors, but with all the same great capabilities. For clean design and simple installation - you're in the right spot. The Mira Series EL6 a Peninsula Table, a Return, and a Pedestal File/File (for Credenza/Return). The Mira Series Typical MEU1 consists of a Desk Shell, a Credenza Shell, a Hutch, a Bridge, a Pedestal Box/Box/File (for 36" Desk), and a Pedestal File/File (for Credenza/Return). The Mira Series Typical MEU2 consists of a Peninsula Table, a Credenza Shell, a Hutch, a Bridge, and a Pedestal File/File (for Credenza/Return). The Mira Series Typical MEU3 consists of a Desk Shell, a Credenza Shell, a Bridge, a Pedestal Box/Box/File (for 36" Desk), and a Pedestal File/File (for Credenza/Return). The Sorrento Series Typical #1 consists of an Executive "U," Bowfront configuration, a Right Bridge PBF-Desk, a FF-Credenza, a 72" Hutch with Double-Height Doors, a Hutch Organizer (Horizontal), and a Hutch Organizer (Vertical). The OFM office furniture features modern styling for your office or work room. The OFM office furniture combines clean, modern lines with stylish accents and a wide selection of tables, desks, and chairs. Paoli Altamont - a collection of exceptional furniture for the executive office. Surfaces of cherry or maple, inlaid veneer tops and oval glass tops for select models reveal a classic character, with an appreciation for modern storage and function. Fine craftsmanship and excellent customer service. Designed for Paoli by Archetype +. Paoli Prominence - Executive Table Desk - 72" x 36"
Paoli Prominence - Flexible and durable executive Laminate and Wood furniture. Cherry and maple _ pedestal and full-pedestal desks for professional offices and workspaces. inTWO collection. Paoli Revival - Flexible and durable executive Laminate and Wood furniture. Cherry and maple _ pedestal and full-pedestal desks for professional offices and workspaces. inTWO collection. Need a better way to connect for business? Our updated Mini-Module is the solution. Now with fluid one touch action, updated profile, and improved functionality, it's available in soft touch finishes and molded colors. The Legend office furniture collection allow you to customize your conference or meeting room the way you want it. All Legend components feature crisp lines, fluted edges, and rounded corners. An innovative class of freestanding private office and administrative furniture, Miro was developed for progressive organizations whose executives, managers and other leaders seek an updated alternative to conventional office furniture. Save up to 70% on your purchase of our office furniture. We offer a broad collection of desk configurations for the most sophisticated executive suite and for your stylish home office.